My dear friend Bob McGarry went to be with Jesus yesterday afternoon. As i pulled up to his house to visit i saw a lot of cars in and around his house. He did have a lot of friends and I didn't think i was going to find out i had just missed him. He had passed just 45 minutes before i had got there. Bob started working with us in 2006 and he stayed with us until he got sick with cancer about a year and a half ago. After we had to lay off all our employees in 2009 and it was just me and my dad working in the shop, Bob still came in and helped. We could always count on Bob. He said i was family and he always supported me. He told me, "i always believed in you, and i know you are going to make it." And that was all i needed to just keep going on. With all of the support i have had from certain special people in my life Bob was definitely one of my top supporters. He showed me the true meaning of Christianity. He exemplified Jesus' Forgiveness and Love in his life and shared it with others. He always said "if Jesus could forgive him and his past, anyone could be forgiven." I am at peace knowing he is in Jesus' presence and not in pain any more. I know i will see him again, but right now it just hurts so much. I don't think i told Bob enough how much i appreciated all that he did for me and my dad at the shop and as a friend. When we were building the 2,000 wine bottle cutting boards in 2010 Bob was cutting all the pieces of wood to be glued up while i was in the other building putting mineral oil on the finished cutting boards. One of the guys ran in and said, Bob cut his thumb! I knew it was possibly bad, and i ran into the shop and said "lets go". Bob and i got into my car and i took him to the emergency room. I waited for awhile hoping his thumb was still intact and then was able to go in and see him after they put the stitches in and his thumb was saved! I was so thankful. I was never so scared and felt so responsible because he was helping me build these boards and risking his thumb!! That is the kind of man Bob was, a kind generous man who cared about others. He cared enough about me to stick around and help. I will be forever grateful. What a witness he was!! I am going to miss him greatly. Love to you Bob! I get tired of the couch being in the same spot and i change it. I move the piano to another room all by myself. The economic out look is changing. I finally see some light at the end of the tunnel. I was able to train someone to work in the finish shop so that it could free me up to do other things in the shop and office. With these new challenges comes an acceptance of change that i know i can find where i need to be and what i need to be doing. YES!! you read that right!!!!! 720 BOXES How am i going to get it done????? We have till January 31st to get these done! this girl gets to meet Lauren Bush Lauren!! Mr. Know-it-All told me to "dream on." My dad said, "I was up to more shenanigans again." I was minding my own business and following up with one of Lauren Bush's associates Katy that had emailed me previously. She wanted to buy some of the FEED Boxes from us to sell on their FEED Projects website. A lovely note from Katy saying she was searching for my address and she found my custom cabinet girl blog. She read it and said she would be happy to have me come to FEED in NYC at any point. She said I could meet Lauren Bush and that they would be happy to have me meet them!! I thought, how did she know I wanted to meet Lauren and then I remembered......I had wrote that I wanted to meet her on my blog!!!! Oh my GOSH!! I did it again, and not on purpose. Well, it was sort of on purpose but I didn't think it would actually work. Now, I just have to get a plane ticket to NYC!! So it all started in November 2013 when I got an email from a buyer at West Elm that I had met 10 months earlier at New York at the gift show. She wanted to see if I would be interested in making these FEED boxes for West Elm. I was honored and excited, and of course I accepted. She asked if I had the capability to engrave the boxes and I said sure, because that's the kind of stuff you figure out later. When your excited like me to be in a new store and make something new, you will try anything! So of course I made all the samples they asked for and my dad did such a great job building and designing the boxes. They were so well built the buyer talked about how the FEED project people loved them!! And then I started to think, well who are these FEED project people? Because to me I thought it was just a line of products designed by West Elm......... I had no idea what information I was about to receive. FEED is a nonprofit company that was started by Lauren Bush Lauren. They sell all kinds of products and the proceeds go to feed hungry children. She is the niece of President George W. Bush! Oh, and she married Ralph Lauren's son. I can't believe how small our world is! So our boxes are going into the West Elm stores and part of the proceeds from each sale will go to feed the hungry children right here in the U.S.A. The box on the left is the utensil caddy for holding your big utensils on the kitchen counter. The boxes below are for holding 6 bottles of wine. My mom suggested using them in the bathroom to hold towels too. This is the first project I have spent this much time, effort, brains, love, sweat, tears, and anxiety on...........and I am so happy to be a part of it!! All I have to do now, is find an excuse to meet Lauren Bush and get invited to a family BBQ!! I've been working on "Bed Bath & Beyond" as you might have read a few posts back and I finally got a response. As you can guess from my title its a response that stumped me. It has the word "unfortunately" in it too.......and i REALLY HATE that word. Anything that starts with "unfortunately" deserves a deep breath and some "self motivation" before proceeding with the information. 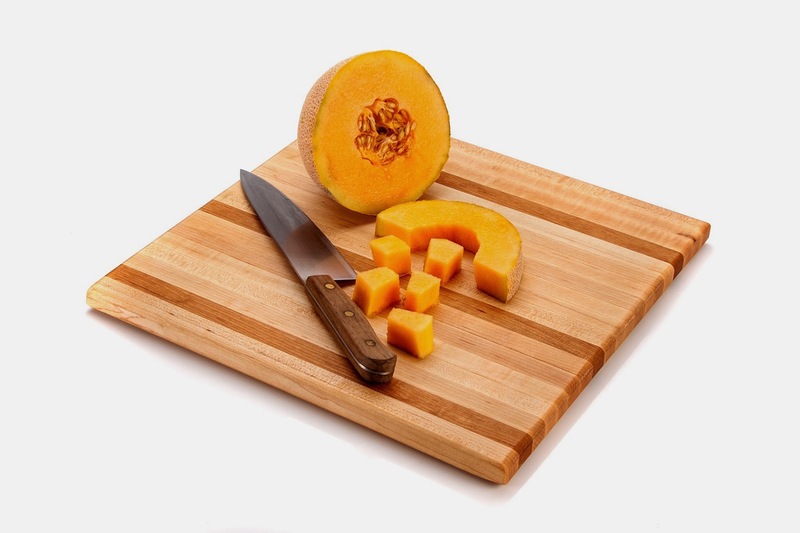 Anyways, "she"﻿ the buyer said that they have a collection set up of cutting boards in their assortment at "Bed Bath & Beyond" and they are not in need of mine, but if i have something new and interesting she would love to see it. (I did send her something "new and interesting" but nevermind). So I thought about it, and of course i took her up on it!! Mr. Know-it-All said, "she has no idea how dangerous it is for her to give me her contact information because i am a pest", but i don't care what he says. so........i emailed again with the pictures, and how i investigated their assortment, and how my board would be wonderful for "Bed Bath & Beyond." Well, Its a No Go. Done. Stumped. What to do next? On Friday Melissa and i delivered an entertainment center, which might i say was very heavy......... We were greeted by a very nice older man who said, "i need to help you girls out, but i have a cane and only one good arm. This just isn't right with you two girls delivering these cabinets, are you going to make it?" Mr. Know-it-All says, "doubt April will make it, and she will make SURE she does make it." I love a challenge, and i love surprising people with extraordinary products and service. And i love being a girl who does "stuff only guys do." This is Melissa and me in the van this morning. We delivered a couple of small open bookshelf's to a nice older man in Lodi and he said, "well i don't want to be sexist, but its not right for you two girls to deliver these." I will take it as a compliment as i drive back to the shop and turn onto Pine Street this guy in a truck looks at us both like we are aliens in the van. Silly boys, cabinet building and delivering is for girls too. March is almost over and today the 28th i finally figured out how to get information to Bed Bath & Beyond. It was BEYOND me on how to do it for 3 weeks now. So.....it only took three weeks but i was able to go back to that vendor site today and find a form to fill out and email a submission. Why haven't they called yet? 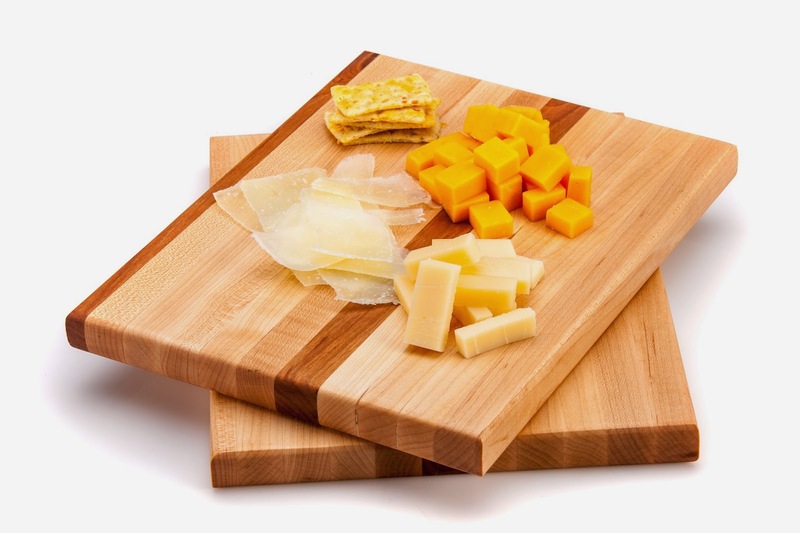 This is one of our more popular side grain boards which is why i sent it to Bed Bath & Beyond. And the cantaloupe looks good, makes me want cantaloupe now. Back to the story, so after all this month building chef boards, finishing kitchen cabinets, doing paperwork (that doesn't help anyone but the accountant), i learned something very important. It takes me too long to figure stuff out. Did i mention that February is a short month? If not i just realized that its over and that we are on the 5th day of March today. As my favorite Grandpa would say, "Holy Crap!" I was supposed to persue, bother, antaganize, yet another vendor last month, "Bed Bath & Beyond" and well, obviously that didn't happen. Mr. Know-it-All calls me a pest by doing this one vendor a month thing, so with that in mind, I am going to try them again this month. This time i will actually call or something. Thats BIG news because its a stick (and i have never driven a stick before), and its got forks on it to lift stuff (which i have never done that before either). I had an accident where wood kicked back, hit my wrist and then my face giving me a cut on my lip which doesn't look good and makes me feel very vain. I keep thinking when someone is talking to me that i should just say i got in a fight or something. but i do love the smell of fresh new sawdust and the baby soft sanded cutting board. So I had decided last month that I would only focus on one vendor each month so that my A.D.D. mind is on one vendor at a time. Mr. Know-it-All thinks my idea stinks but that is another story. Crate & Barrel was chosen for January so i was on the task. I learned some new things from this particular experience. 1. When you contact a person you have to wait the appropriate amount of time before you contact them again if they refuse to email or call you back. 2. Because of #1 I have a #2 and that is, if they wait a week or two to get back to you it takes more time out of the ONE MONTH you want to get this done!!!! 3. Each buyer is different and this one only goes to a gift show in Chicago when considering who she wants to purchase from. 4. I tried to see if I could be in that gift show and its already sold out so I would have to go next year. 5. Should I go to one gift show just because one buyer goes there???? 6. She has not responded to my offer of samples even though I tried to get in to the Chicago gift show and it was already booked. Moving on, I am now into February already the fourth day and I have to focus on another vendor. I like to just randomly pick one off the top of my head because that's how organized i am so its going to be Bed Bath & Beyond. I am also realizing that February is a short month and with that I have to get going on it. On another note, i have 50 chef boards to get out by the end of this week and another 50 are due in 5 weeks. Also i will be making wine bottles for the Napa Style catalog and online store that will be due shortly. I am really overwhelmed and would like to just take a nap but that will have to wait until I am dead.